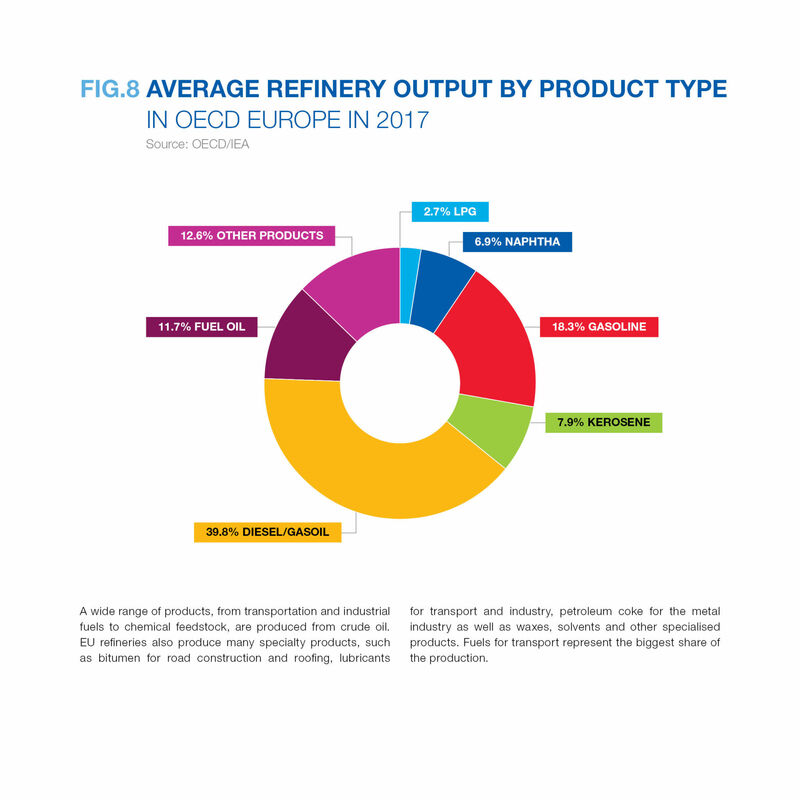 The EU Refining Industry operates within two global, open and transparent markets: crude oil and refined products. Within these markets crude oil and refined products are freely traded, allowing each business segment (exploration-production, refining, and marketing) to operate independently. Further, both the high number of operators within each segment and the general transparency of the markets create a highly competitive environment for these activities. In recent years, high refining margins and a buoyant outlook in the demand for oil products – driven by robust growth in the developing world – has led to a large number of global refining investments. While many of these projects – notably in China and South East Asia – focused on satisfying local demand, some projects in India and the Middle East are capable of producing high-quality fuels for exportation to the EU and US. Furthermore, since emerging economies are seeking to align their product specifications with European and US norms, many of these new refineries are producing fuels that specifically target these markets. The onset of the global economic crisis has dampened demand for fuel in Europe and North America. Regardless of the current market conditions, however, new refineries in China, India and the Middle East are expected to come online in the coming years. With domestic demand for high-quality fuels still low, these refiners will still turn to the EU to export their products. Indian and Middle Eastern refiners are likely to use the EU market as a temporary outlet for excess production, whilst the local markets continue to grow to a level where they can sufficiently absorb production. Over time, the combination of domestic market growth and a tightening of product specifications could see these regions shift their focus towards their own domestic markets. In the meantime, however, exports from India and Middle Eastern refiners will add competitive pressure to the EU refinery system. Meanwhile, the Chinese government’s objective is to remain self-sufficient in motor fuels. This has resulted in a large number of new refineries coming on stream in recent years. Even in the wake of the global financial crisis, the Chinese economy continues to increase. Driven by an increasing demand for oil products, economic growth has been robust and the production capacity of the Chinese refining system is only expected to increase in the next decade. Needless to say, Chinese companies have also started looking overseas for new refining opportunities, mostly for import back into China. EU supply and refining is very vulnerable to global influences. As a result of gasoline/diesel imbalances, new trade patterns between the EU and the rest of the world are being established. For example, gasoline exports to Asia, US and Africa, imports of distillate from Russia, the Middle East and, recently, the US have all been recently established. New refining capacities in Asia and the Middle East is pushing oil products both into the European market and competing export markets. These trends seem set to continue as further new capacity comes on stream outside the EU. The declining gasoline demand in the US will lead to declining gasoline opportunities for EU refineries to export gasoline surpluses. The similar trend can be observed in Europe, where gasoline demand continues to shrink while transport distillate– jet fuel, road and maritime diesel – continues to grow. More so, the increasing level of bio-components in gasoline further emphasises the reduction in fossil gasoline demand. If the demand barrel is not balanced by exporting the surplus of such lighter components as gasoline, many EU refiners will struggle to maintain operations.